Jill Of All Trades: Urban Vs Rural? Wrong, #SaathiHaiHum. If someone had to ask me, what do you think villagers do? The picture that comes to my mind, thanks to the stereotypes image taught to us right from our school days; is that the farmers plough the field, working hard from dawn to dusk. The women gather the water for their needs, do the cooking on choolhas and probably have 4-5 children at-least. The kids probably help in the house work or if they go to school, it's far away and they travel a lot. This is what I think is the life in the village. 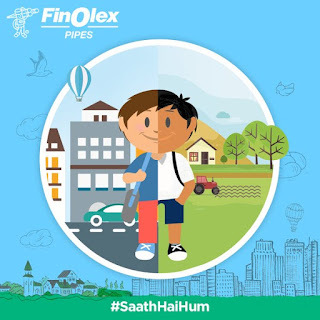 Finolex Pipes has released its new campaign that aims at highlighting the modern India wherein occupation or the geographical boundaries no longer decide the fate of an individual. Their video served this powerful concept in a very simplistic and yet, in a very thought provoking way. 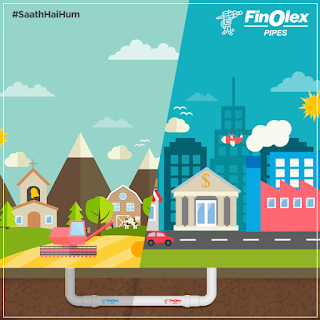 Finolex Pipes has a strong hold over the rural as well the urban Indian market. Over the years, they have managed to reach out to the remotest of villages as well as the soaring metropolitan cities. However, it was not the striking geographical diversity that drove them to come up with this initiative. Finolex observed that one of the biggest misconception walking along the so-called ‘city dwellers’ was that the force driving the nation came solely from the cities while villagers have only gone as far as the traditional farming. While this could have been a bitter fact in the past, the modern India shows a completely different picture. Finolex was deeply motivated to break this stereotype and bring both the segments together as ONE and that could only be achieved by bridging the communication gap between the people. Thus, was born the #SaathHaiHum” campaign. 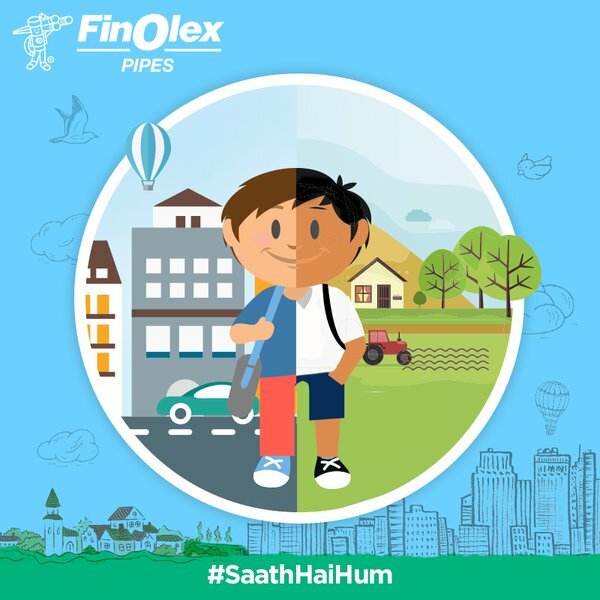 In just a few minutes, Finolex Pipes’ remarkable video showed that even villagers are capable and are marching shoulder to shoulder with the rest of the nation towards a successful future. They established very aptly that a mere conversation can be the window to bring the two sects together. Finolex Pipes, as a part of the #SaathHaiHum campaign has issued an e-mail address through which people, coming from different parts of the nation, can send in their questions regarding the life of a farmer or a villager. These people will then be connected via con calls to villagers. This direct conversation will allow people to look into the life of a modern day villager that will eventually put all their notions to rest and bring the nation closer. If something can bridge the gap between the city and a village, then this is it! “To those who work in acres, not hours we thank you." - Nitin Kulkarni, President – Sales & Marketing, Finolex Industries Ltd.
Finolex Pipes believes that as a nation, rural or urban, rich or poor, we’re all Indians. As Finolex Pipes works through cross sections of India uniting one another, we believe we are divided & this video states as a gentle reminder that by listening, conversing, communicating & forming a pipe line amongst ourselves, we can allow love to flow. Further with the Agricultural budget 2016 being one of the highest it’s ever been in years, this is the perfect time to show that a large chunk of the countries investment is going to hard working farmers who are essential for our survival & help improves the country’s GDP through crop exports, further helping India being showcased on an international level. And this can only be achieved if we work together. After viewing the video, and seeing what the facts are as of today, the respect I have for the farmers and villagers has grown ten-folds, and I really feel that the next vacation I take should be in a village. In-fact what a fabulous idea it would be, to have village-exchange as a concept during college, instead of foreign exchange, wherein we give village going students a chance to experience city life and college, and urban college goers a chance to live in the village! In a country like India, vastu shastra for home is considered one of the basic requirements while constructing a property or building according to pre-specified principles. It is necessary to follow these principles for wealth, health, fame and prosperity in life. Though it has become difficult to follow each and every principle in the present era, it is important to make maximum use of tenets in order to achieve peace and harmony in life.